Hugoye: Journal of Syriac Studies vol. 5, no. 2 (2002), pars. 1-13. Abstract. The lively verse dialogue between the Repentant Thief (Luke 23:43) and the Cherub guarding the entrance to Paradise (Genesis 3:24) is an excellent representative of the ancient literary genre of dispute literature that has remained popular in the Middle East in various languages for nearly four millennia. The aim of the present article is to make the poem available in translation to an English-speaking audience. The introduction gives an outline of the poem’s wider context, and ends with some suggestions about how it might be revived for use today. The Syriac dialogue poems. The great majority of the Syriac dispute and dialogue poems deal with biblical subjects, though there are a few on secular topics.4 In those that take their starting point in an episode in the Bible, the dispute element is usually more in the form of an argument, and this, while presented in a lively (and sometimes humorous) manner, may at the same time convey some underlying teaching of a more profound nature. It is not known what the exact context, liturgical or other, Ephrem had in mind for his Disputes between Death and Satan, but subsequently these dialogue soghyatha came to be written and used for the Night Office (Lelya/Lilyo). In the extant liturgical manuscripts the dialogue soghyatha are mainly grouped around the Nativity-Epiphany and Holy Week. The poems tend to be preserved in their complete form only in the earliest manuscripts, dating from the ninth to the twelfth century; in manuscripts of a later date the poems are often either abbreviated or with alternate stanzas only (thus giving only one speaker’s verses); in the latter case, the manuscript was specifically intended for use by just one of two choirs. The Cherub and the Thief. Like many of the Dialogue soghyatha, that between the Cherub and the Thief takes as its starting point a single biblical verse, namely Luke 23:43, where Christ tells the Thief who acknowledges him, “Today you shall be with me in Paradise”. Some other treatments of the theme. The soghitha may well have been known to Jacob of Serugh (d. 521), one of whose verse homilies is on the same subject; attention is drawn to the main parallels in the brief commentary which follows the translation. After a long prologue (pp. 658-666), Jacob’s memra provides the following speeches: Thief to Christ (pp. 666-668), Christ to the Thief (pp. 668-669); these are followed by a narrative, and then the Cherub and the Thief are given alternating speeches: Cherub to Thief: pp. 671-672, 673-673, 675, 676-677, 680-681, 684-685; and Thief to Cherub: pp. 672-673, 674-675, 675-676, 677-680, 681-683, 685-687. Jacob’s older contemporary, Narsai, by contrast, does not provide any homily on this subject. In Greek literature of the period there are occasional vague parallels, where the Cherub is introduced, but a sustained dialogue between the Cherub and the Thief is very rare, and is best attested in the second half of a Greek text attributed to John Chrysostom (Clavis Patrum Graecorum 4877), published by M. van Esbroeck, together with early Georgian and Arabic translations.10 The few parallels between this text and the Soghitha are noted in the Commentary below. …the boy to whom it has been given to ‘act the Penitent Thief’ for that year, storms the sanctuary vi et armis, and is driven back again and again by the blazing torches held by the deacons, who for the nonce represent the Cherubim that guarded Paradise with the flaming sword. At last the Penitent Thief secures the cross that lies always on a table at the entrance of the sanctuary – and which each worshipper kisses on entering the church – and comes forward brandishing that passport to bliss. Then the deacon-angels receive him, and – seeing that souls are always borne by angels into Paradise, and also that no unordained man my set foot in the sanctuary, the boy is carried pick-a-back into the ‘Altar-enclosure’. It is not only with children that these lively dialogue poems deserve to be brought back into life again, for they could also well be used to good effect set to music once again – either employing their traditional qole (the most commonly found is ‘Amo w-’amme), or to new musical settings. It would seem that here is a wonderful opportunity for the various Suryoyo gude, or musical groups, to draw creatively on this their splendid heritage, whose roots lie in ancient Mesopotamia. 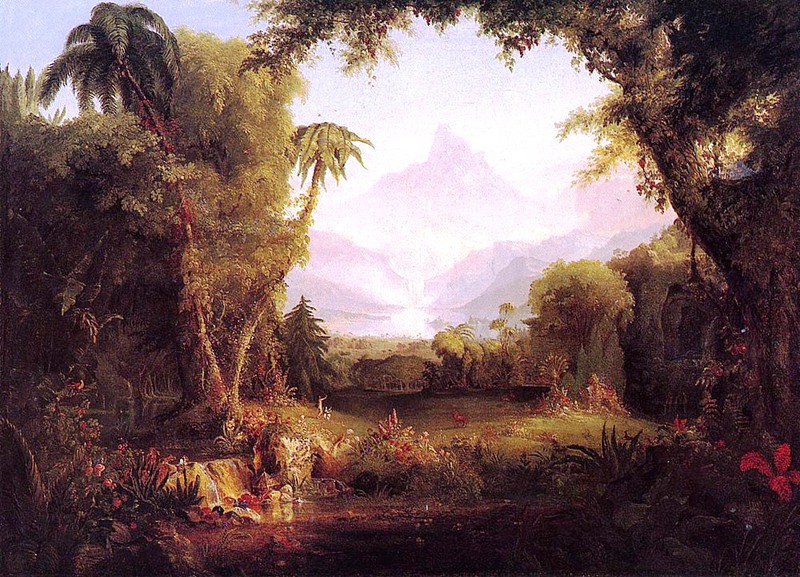 in the Garden of Eden – which is the holy Church. Reveal and explain to me who it is who has sent you”. and it was your Lord who sent me on my way here”. and I have come to enter here, seeing that He has given me confidence”. Turn back, my man, you have lost your way”. to open it up and enter: I will not be prevented”. so that your blade no longer kills”. you shall not enter it, so don’t argue any more”. It is to no purpose that you are standing here”. – and you are a murderer, and a shedder of blood. It was He who has sent me to Paradise”. – so that our race may now enter without any hindrance”. and pinned it there with nails so that it won’t be exacted”. and he’ll encounter it should he come near”. a path leading back into the Garden. he has left here and not returned again”. and they have sent me in advance, to open up for them”. and so I’ve no fear, seeing that it was He who has sent me”. and the sword of fire is guarding it”. for the sword is not blunted and made dull. there’s no means by which it can still be kept closed”. and by it, Adam, once expelled, shall return”. you can’t travel on any further and enter among them”. and they worship before it, while me they hold in honour”. permitting Adam to come back into the Garden”. the blade will flash out against you”. look and see if it’s genuine, and don’t be so angry”. from entering Eden, seeing that He has so willed it”. and the path to Eden is no longer cut off”. enter in, O heir; I will not turn you back”. for we have returned now to your city”. for the gate is now open for those who repent”. for we have been mingled into your race”. enter inside the Garden with exultation”. so that we shall not longer be deprived of your race”. 3:b ..when you will be revealed. d (May I see) Your compassion. c that had strayed from the flock. 27:c ..raised up the dead. d and He has sent me. b and put on a body. c who had been driven out. d who had been in a state of anger. d come and enter Eden. 47:b His love willed it. 2ab cp JS 666:19-20, “He (the Thief) sought from Him mercy, that He would have compassion on him in the Kingdom; / he made supplication that was full of suffering to present to Him”. 2d cp JS 666:22, “Open up the door of mercy to me so that I may enter the fair place”. And 668:21, “He opened up the great door of mercy before his petition”. 3d cp JS 668:5, “I have acknowledged You”. 4c cp JS 668:22-669:1, “Verily, verily I say to you, consider as true, O man, / that today you will rejoice with me in the Kingdom”. 5b For the Cross as a “key”, see already Ephrem, Hymns on the Resurrection II:1; in Jacob, cp JS 669:10, 670:15, 674:3 (also in his Letters, ed. Olinder, 3:19-20). 6ab For “royal missive” (saqra = Latin sacra), cp JS 669:20-21, and especially 670:4, “with His living name He would seal the royal missive (saqra) for the thief on the right hand”. Though not yet found in Ephrem, the term saqra is later frequently used to denote messages from the heavenly world to earth, above all in the context of the Annunciation. That it was a letter from Christ which the Thief took with him is a theme found in a few Greek sources, notably Romanos’ Kontakion on the Adoration of the Cross (ed. Maas-Trypanis, no 23), stanzas 10-11 (where the Thief tells the Cherub that he has with him a letter (gramma) with Christ’s seal on it; likewise in the Greek text attributed to John Chrysostom, edited by van Esbroeck, Thief tells the Cherub that “Christ has written for me a letter (epistolen)” (section 8). In the Cave of Treasures 51:23 (ed. S-M.Ri), Christ wrote with his own blood a saqra of Adam’s return and sent it by the hands of the Thief. 7d cp JS 671:2, “The Cherub met him and stood there in amazement to question him”. 9c cp JS 673:1, “I am a thief who used to go about with hateful deeds”. 10c For “sea of fire”, cp JS 670:18, 671:12, 673:21. 12c Behind the term “fenced” (sig), lies an allusion to the “fence” (syaga) of Eph. 2:14, “He has broken down the fence of hostility”. Syriac writers regularly understand this verse as referring to the “fence” keeping humanity out of Paradise, subsequent to the Fall); thus already Ephrem, Madrashe on Paradise II.7, IV.1 etc; cp JS 686:20, “He has broken down the fence, and so your standing here is redundant”. 13a cp JS 674:11, “I was a thief, but mercy captured me from (my) hateful deeds”. 14bcd cp JS 674:4-5, “And there is a wall of fire and you cannot break through the partition; / the blade of fire flares out and is fearful, and if you should be so bold…”. 19c cp JS 674:12, “I bathed and was scoured clean of the evils with which I was befouled”. 30c The term “Shekhina” (shkinta), or Divine Presence, is quite common in Syriac poets from Ephrem (e.g. Madrashe on Paradise II.11) onwards. 33b The East Syriac text, with “put on a body” almost certainly preserves the original reading here. This archaic phraseology (already found in the Acts of Thomas, Aphrahat, Ephrem, and in the earliest Syriac translation of the Nicene Creed) was subsequently disapproved of by Philoxenus in the light of the Christological controversies; it was accordingly avoided by many (but by no means all) Syrian Orthodox writers. 36a For “The ranks of fire” (sedray nura), cp JS 669:19. 40a For “man of blood”, cp JS 675:19 and 677:2. 44d cp JS 669:18, “Tell those who are lost that Adam, the heir, has returned”. 47b The phrase “His love has constrained Him” also occurs in the Soghitha on Mary and the Angel (verse 1b), and in a Soghitha attributed to Ephrem (Soghitha II.2 in E. Beck, Hymni de Nativitate): “The daughter of poor parents has become mother to the Rich One / whose love has thus constrained Him”. The same verb (‘sa) also features a number of times in Jacob’s memre (e.g. I, 507; II, 137),12 although not in that on the Cherub and the Thief, where the nearest parallel is 686:18, “He became a Mediator and pacified His Father for His love so wished it”. 1 Overviews can be found in G.J. Reinink and H.L.J. Vanstiphout (eds), Dispute Poems and Dialogues in the Ancient and Mediaeval Near East (Orientalia Lovaniensia Analecta 42; Leuven, 1991); R. Murray, “Aramaic and Syriac dispute poems and their connections”, in M.J. Geller, J.C. Greenfield and M.P. Weitzman (eds), Studia Aramaica (Journal of Semitic Studies, Supplement 4; 1995), 157-87; S.P. Brock, “The Dispute Poem: from Sumer to Syriac”, Journal of the Canadian Society for Syriac Studies 1 (2001), 1-10. 2 Modern Syriac: e.g. L. Yaure, “A poem in the Neo-Aramaic dialect of Urmia”, Journal of Near Eastern Studies 16 (1957), 73-87 (Samovar and Boys); Modern Arabic: e.g. C.D. Holes, “The rat and the ship’s captain”, Studia Orientalia 75 (1995), 101-20. 3 Carmina Nisibena LII-LIV; English translation of LII in S.P. Brock, The Harp of the Spirit: Eighteen Poems of Saint Ephrem (Studies Supplementary to Sobornost, 4; 1983), 70-72. 4 A list is given in S.P. Brock, “Syriac dispute poems: the various types”, in Reinink and Vanstiphout, Dispute Poems and Dialogues, 109-19 (reprinted in From Ephrem to Romanos (Aldershot, 1999), chap. VII (and Addenda, 4-5). 5 Whereas the Hebrew and Septuagint have the plural, Cherubim, the Peshitta has the singular. 6 Torino, 1993. On the cover will be found a reproduction of a medieval illustration of the topic (for this, see J.Leroy, “La sogitha du cherubin et du larron, source d’une miniature du manuscrit syriaque BM Add.7169”, Parole de l’Orient 6/7 (1975/6), 413-19. 7 Monastery of St Ephrem, Holland, 1982 (it features as no. 13, pp.61-5); for the contents and sources of this collection of 26 pieces, see “Syriac dialogue poems: marginalia to a recent edition”, Le Muséon 97 (1984), 29-58. 8 Sogiatha: Syriac Dialogue Hymns (Syrian Churches Series XI; Kottayam, 1987), 28-35. There is also a French translation by F. Graffin, in L’Orient Syrien 12 (1967), 481-90. 9 The East Syriac recension may also be original at 3d, 18d, 25c, 28c, 33a and 50c. 10 “Homélie éphrémienne sur le bon Larron en grec, géorgien et arabe”, Analecta Bollandiana 101 (1983), 327-62. 12 Jacob normally prefers the verb ngad (e.g. I, 609; II, 349, 507 etc.). Graffin, F. “La soghitha du chérubin et du larron,” L’Orient Syrien 12 (1967), 481-90. Murray, R. “Aramaic and Syriac dispute poems and their connections”, in M.J. Geller, J.C. Greenfield and M.P. Weitzman (eds), Studia Aramaica (Journal of Semitic Studies, Supplement 4; 1995), 157-87. Sachau, E. “Über die Poesie in der Volkssprache der Nestorianer”, Sitzungsberichte der Königlich-Preussischen Akademie der Wissenschaften zu Berlin XI.8 (1896), 179-215.